West Australian musical chameleon David West is adept at sculpting musical gold from the contents of any vein. His Midas touch traverses founding stark world-beaters Total Control into that act’s beating parts – lurking post-punk (Rank/Xerox), stark Italo New Wave (Liberation) and melting disco vanity (Lace Curtain). He even steps out from behind the monikers to take on staccato swathes of synth pop permutations under his own name. But it is as Rat Columns, and especially on latest record Candle Power, that West distances himself from these journeys and crafts something more febrile, crystalline and alive, albeit something that is pervaded with pensive vexation and weary admissions. 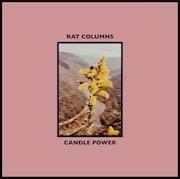 It is easy to think that as Rat Columns West imbibes heavily from the Dunedin pipe, so infused with the Flying Nun virtues is Candle Power’s pealing guitar pop in the opening brace. The chipper xylophone and ebullient bass on ‘She Loves The Rain’, the rambling yet incessant drumming of ‘Someone Else’s Dream’, West’s soft vocals – there is a brightness that is effortless, all loose wrists, lolled heads and crooked grins. But the rest of the album amply showcases West’s proclivity for bowerbird restlessness and pilfering, while staying the course with a throughline of round-shouldered melancholy. ‘Blinded By The Shadow’ is a sparse disco whimsy, Amber Gempton’s echoed vocals of the title joined by handclaps, restless violin and tambourine that threaten to soar into a saccharine sepia. Gempton’s vocals become intrinsically linked with West’s throughout, whether it be alongside the shimmering yacht guitar of ‘Time’s No Vessel’ (where West compares love to “a dark cloud that rains down from above”), the gossamer light of ‘Is This Really What You’re Like’ (love is like “driving a motorbike straight into a wall”) and the sunset chagrin into doo-wop sway of ‘You Don’t Have To Try’. This song perfectly demonstrates the shifting sands of West’s musical tendencies while remaining pure to his sad-eye aesthetics – the sparse plucked guitar strings, the dragged brushes across the skins, the beautifully muted bass, then an apocryphal synth line underpins Gempton’s lyrics before the two of them entwine in a slow-dance. The pop aesthetics are put to the side on occasion. There is the late-night retro-fit synth shimmy of instrumental ‘Candle Power II,’ spiked with piano stammers, radio pop and snap, sonorous violin synapses and a shuffling lounge beat. The post-punk earnestness and insistence of ‘Northern Soul’ has a lusciousness of production that envelops, a black-silk unfurling of the unspooling highway under a gloaming sky. Candle Power finishes with ‘Dream Tonight’, all tinny drum machine, slinky bass and slightly hazy keys, an Antipodean New Order track writ large. The bowerbird approach, the ebullient instrumentation, the flitting from the shadows of one musical influence to another, may offer a new hue to the Rat Columns palette, but one thing remains steadfastly the same – West’s melancholic, hangdog approach to life and love. The album remains an accessible yet bittersweet pop record.